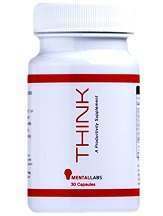 In this review of Think, the productivity supplement created by Mental Labs, the main characteristics of the product will be laid out to help potential customers decide whether to buy it or not. Made of 100% natural ingredients, Think differentiates itself from other nootropics by its use of the Polynesian root Kava. This plant is supposed to be a relaxing substance that frees the mind to enhance clarity. The product is available on Mental Labs’s official website and other specialised retailers. Think is a performance supplement, and as such should be taken before a complex task. The manufacturer suggests 2 capsules 15 minutes prior to a big exam, a legal brief or an all-nighter. The basic package of Think, with 30 counts, is currently being sold for $29.99. The company offers a bigger bottle, with 60 capsules, for the promotional price of $49.99 — a discount of 17%. Taking Think before a big task does exactly what it says in the tin: I felt an increase of blood pressure to the brain and an energy boost. Although caffeine is one of its main ingredients, the feeling of clarity is not the same that is achieved with coffee. The feeling, however, doesn’t last very long, and I saw myself longing for another dose in the middle of the process. Since Think is a product that contains a high dose of caffeine it shouldn’t be combine with other sources of the substance. Also the product is not recommended to pregnant or nursing women or anyone with a heart condition, thyroid disorder or seizures. People with medical conditions like low blood pressure, psychosis, diabetes and others are told to consult their physicians before using it. If any adverse reaction arises after the ingestion of Think it is recommended to suspend its use and visit a doctor. Mental Labs encourages its customers to get in touch with them via email in case of any questions or concerns about Think. They don’t, however, offer a return policy in case of dissatisfaction with the product. For a quick boost in brain activity for an important task Think is a reliable solution. It’s got the right combination of elements to help brain activity under pressure. In the other hand, the lack of information regarding its side effects and the absence of unbiased reviews of it on the internet are causes for concern.